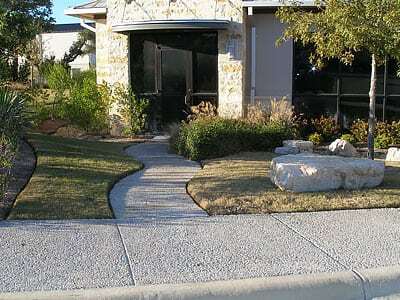 The first installation of Enhanced Pervious Concrete by Environmental Equations was 1999. EE, Inc., who is passionate about the environment, knew that Enhanced Pervious Concrete would be the future. During the past 19 years, Enhanced Pervious Concrete has become increasingly recognized as a logical solution to many of the issues caused to the environment from urban sprawl. EE, Inc.’s perseverance and passion of finding the best Enhanced Pervious Concrete solution has resulted with Rain-Crete®. Rain-Crete® has been formulated for convenient use with Volumetric and Ready Mix trucks. Rain-Crete® when fully cured exceeds 4,000 psi, making it tough and strong enough for roads. It is strong enough for commercial vehicles and porous enough to eliminate black ice and standing water from heavy rain. We can prove that Rain-Crete® is reliable even after up to 19 years since installation. Some of them are featured on this site and ALL of them are still strong and reliable! We recommend Rain-Crete’s® use for driveways, patios, sidewalks, pool decks, sport courts, parking lots, roads and the elimination of retention, detention & water quality ponds. We have the system that will work and is approved by (TCEQ) Texas Commission of Environmental Quality. No more ponds that take up space, needs continuing maintenance, and are a haven for reproducing mosquitos. Contact us and we will explain how this can be successfully done. Learn how to obtain your Rain-Crete® Installation Certification and get started today! Want to become a supplier for our environmentally-friendly concrete mix in Texas or California? Contact us for detailed documentation of Rain-Crete® in action and application results.